Selected students are inducted into the Sigma Xi Society at the annual banquet and ceremony held April of 2019. Sigma Xi is the international multidisciplinary honor society for scientists and engineers. 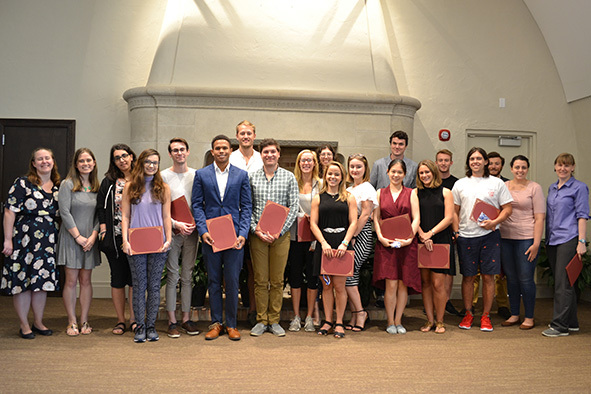 Students are nominated by a faculty member from Rollins College or a research institution and chosen for induction by the Rollins College Chapter of Sigma Xi based on their record of research achievement. Alternatively, students may be nominated by Sigma Xi judges after successful presentation of a poster at the national Sigma Xi meeting. Membership in Sigma Xi is by invitation only, and induction is offered only to individuals who have shown potential as scientific researchers. The Rollins College Chapter of the Sigma Xi Scientific Research Society has been active since 2008. Over 70 students have been inducted into the society at the annual banquet and ceremony held in the spring. These students have demonstrated their capacity for research through their experiences both at Rollins and other prestigious institutions, such as Yale, Harvard, UC San Diego, University of Maryland, Mote Marine Lab, University of Washington, and others. To that end, Sigma Xi publishes the award-winning American Scientist magazine, awards hundreds of grants annually to promising student researchers, and sponsors a variety of programs that serve science and society. Primary programmatic interests include research ethics, science and engineering education, the public understanding of science, international research networking and the overall health of the research enterprise. At the Sigma Xi Center in Research Triangle Park, North Carolina, the society is enhancing and expanding programs in support of its members, chapters and the research community. Since 2008 at Rollins College, 108 students have become members of this prestigious society. Below is a list of the latest students that were accepted into Sigma Xi.